This session is all about working with the push notification features of iOS 3.0+. 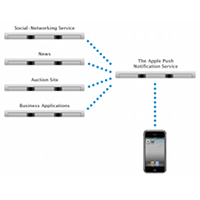 It will cover everything you need to do to get push notifications working in your application, such as registering for notifications, configuring your application in the iOS Provisioning Portal, sending notifications to Apple’s Push Notification Service (APNS), and handling them in your application. Let's ge started.